Marina Ovtsynova has received her Music Performance and Music Education degrees from Ukraine, Mannheim Germany, and a Bachelor’s Degree in Music Performance from Kennesaw State University in Georgia. As a soloist or as a member of an orchestra she has performed in many countries around the world, such as Ukraine, Germany, Italy, France, Holland, China, and USA. Marina also worked with the Mannheim Chamber Orchestra and the SAP orchestra. She has recorded with the Incontro Quartet in Mannheim. Marina began her music studies at the age of 4. Her first violin teacher was Lidiya Vasilchenko, who studied violin with Yuri Jankelevich, one of the greatest teachers in the history of the Russian violin school. After moving to Germany she attended Master Program of Music Education and Performance at the Mannheim University of Art. Her violin professors were Dietmar Mantel and Mechtild Boekehler. Marina has always been interested in teaching music to small children, so she attended the one-year program of Elementary Music Education under Professor Seeleger in Germany. After she moved to the US she continued her education at the Kennesaw State University. Marina has been the recipient of the Annual Flourish Scholarship in Music in 2010 and the Audrey and Jack Morgan Scholarship in Music in 2011. She performed Four Seasons Vivaldi as soloist with the Kennesaw Philarmonic Orchestra, she also has performed with the Georgia Symphony Orchestra. 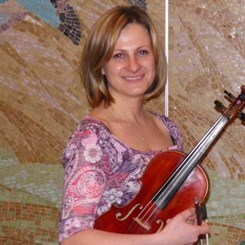 Presently, Marina is working as violin, vioila, and cello instructor at Music and Arts in Johns Creek. Request Lessons with Maryna today!